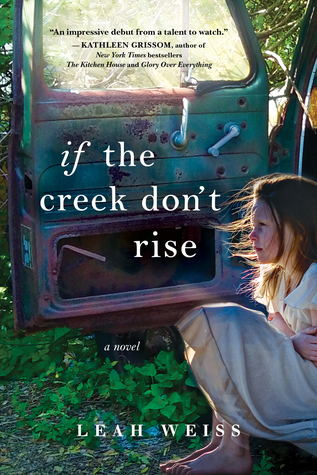 If the Creek Don't Rise by Leah Weiss is a highly recommended debut novel set during the 1970's in the Appalachian community of Baines Creek, N.C. The cast of characters tell the story from their point of view through their own chapters. Weiss have given each character their own unique voice in their chapters. Some characters are heard from once or a few times while others have multiple chapters to propel the story forward through their personal narrative. This approach creates a powerful ensemble piece with strong character development and develops a compelling sense of place in the setting. Sadie Blue has been Roy Tupkin's wife for fifteen days and she knows that she has made a terrible mistake. He is a bully and his beatings are endangering their unborn child, as well as her own life. What she needs to do is listen to her Daddy's voice and find a smart way out. Her dour grandmother, Gladys Hicks, knows what Sadie is going through because she had to deal with her own abusive husband. Sadie's Aunt Marris Jones, a caring, optimistic neighbor to her grandmother, sees what is going on and wants to help Sadie. Then Preacher Eli Perkins welcomes the new teacher to town, Kate Shaw. At 51 years old and over 6 feet tall, Kate is not at all what the community expects, but she is made of tougher stuff than they realize. She is also determined to make sure her students are fed during the time they are in school. Eli is attracted to her intellect, even though she is an agnostic, while his sister Prudence sets out to set others against Kate. Sadie likes Kate and Kate has promised to teach her to read. Birdie Rocas, a neighbor of Kate's and a local healer/diviner, watches Kate, protects her, and then befriends her. Everyone is concerned for Sadie's well-being. If the Creek Don't Rise is a collection of many points of view where the characters are in each other's stories. While the synopsis makes it sound like it is solely Sadie's story, it really is a character driven novel. Telling the story through the viewpoints of different characters works extremely well in this novel with a southern Gothic feel to it. Even Roy gets a chapter. I will note that ultimately, Sadie gets the last word, so the arch of her story is told. The writing is excellent and the characterizations are exceptionally well done. The sense of place is firmly established. I liked the ending too. This is certainly a novel worth reading, but for me, a well developed plot was a wee-bit lacking in If the Creek Don't Rise. Oh, there are anecdotes told and stories shared while confronting the immediate question of helping Sadie, but there were so many other stories and questions that were never resolved. For example, why give us the chapter from Prudence, and then not another word from that harpy? Or just drop the thread of Reverend Eli's attraction to Kate? In the end I liked If the Creek Don't Rise quite a bit, but not enough to give it my highest rating.